The East Mediterranean is becoming a growing centre for natural gas as the Egyptian LNG export market revives and plans are considered for floating liquefaction plans offshore Cyprus and Israel, while a further significant discovery has been made by a London-listed exploration and production company. US major ExxonMobil has signed a sales and purchase agreement with Zhejiang Provincial Energy Group to provide liquefied natural gas supplies over a period of 20 years. April 16 (LNGJ) - ConocoPhillips said it completed the previously announced transaction to sell its 30 percent interest in the Greater Sunrise Fields to the government of Timor-Leste for $350 million that was previously the focus for an Australian-based LNG export project. “We are pleased to complete this transaction with the government of Timor-Leste,” said Matt Fox, Chief Operating Officer. “ConocoPhillips recognizes the importance of the Greater Sunrise Fields to the nation of Timor-Leste, and this sale gives them a significant working interest in this important development,” added Fox. The Sunrise and Troubadour gas and condensate fields, collectively known as the Greater Sunrise Fields, are located in the Timor Sea. April 12 (LNGJ) - LNG Canada, the Royal Dutch Shell-led joint venture in British Columbia, said that Chief Executive Andy Calitz would step down on July 1 to be replaced by another Canada-based Shell executive Peter Zebedee. The announcement comes six months after LNG Canada’s positive final investment decision to build the export plant near the town of Kitimat. Calitz and successor Zebedee have worked for Shell for much of their careers. Calitz, who was educated and began his energy industry career in South Africa, began working for Shell in 1996 and has led the LNG Canada project for six years. He is scheduled to return to Shell’s headquarters in The Hague when he leaves his post. Zebedee currently works for Shell in the Canadian city of Edmonton in Alberta and will relocate to BC. April 11 (LNGJ) - Swiss company Burckhardt Compression said it was awarded a contract to equip a 30,000 cubic metres capacity LNG carrier operated by Knutsen OAS Shipping of Norway with its Laby brand of compressors. Burckhardt said the compressors would be delivered to the South Korean Hyundai Mipo Dockyard as part of the fuel gas supply system built by Wartsila Oil & Gas Solutions of Finland. Wartsila is supplying the LNG carrier’s WinGD X-DF 2-stroke, dual-fuel engine with LNG boil-off gas as fuel. “The X-DF engine, a two-stroke engine from Winterthur Gas & Diesel, allows both natural gas and marine diesel to be used as fuel for ship propulsion systems,” said Burckhardt. “Ship operators can switch between the two fuel types, maritime diesel and the boil-off gas that inevitably evaporates from LNG storage tanks, during operation,” added the Swiss company. 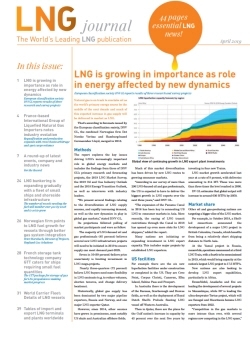 April 10 (LNGJ) - JERA Global Markets, the merged trading entity of JERA of Japan and French firm EDF Trading, launched its LNG activities with the purchase of an cargo from Woodside Energy Trading of Singapore. The cargo will be sourced from the Wheatstone LNG project in Western Australia and will be delivered to one of JERA’s LNG terminals in Japan during May. “We are delighted to be up and running as JERA Global Markets and the team and I look forward to expanding our LNG activities in the Asia-Pacific region,” said Kazunori Kasai, Chief Executive Officer, JERA GM. April 9 (LNGJ) – The Japanese government’s 8th LNG Producer-Consumer Conference will be held on September 26 in Tokyo, jointly hosted by the Asia Pacific Energy Research Centre. The conference was first held in 2012 and the 2018 event was attended by over 1,000 representatives of governments, international energy organizations and companies involved in the LNG industry. “The conference will provide the participants including ministers, heads of international organizations, corporate executives and other stakeholders with a venue for sharing the latest trends in the global LNG market and discussing opportunities and challenges,” said the Ministry of the Economy, Trade and Industry. It will be held again this year at the Convention Center of the Grand Prince Hotel New Takanawa in Minato-ku, Tokyo. April 5 (LNGJ) - The American Bureau of Shipping granted approval in principle to two new gas carrier designs from Hudong-Zhonghua Shipbuilding of China. The two new vessel designs are for a 200,000 cubic metres capacity LNG carrier and a 147,000 cubic metres capacity Very Large Ethane Carrier. “ABS is proud to support the pioneering work of Hudong Zhonghua in the design and delivery of gas carriers,” said Eric Kleess, ABS Senior Vice President for Eastern Hemisphere Operations. “In reviewing novel gas carrier designs, ABS is able to draw on our extensive experience in classification, supporting the safer handling, storage and transport of gas,” added Kleess. April 4 (LNGJ) - The 210,100 cubic metres capacity Q-Flex carrier “Duhail” is scheduled to unload a shipment on April 20 at the UK South Hook terminal at Milford Haven in Wales from the Ras Laffan plant in Qatar, according to shipping data. The delivery will head for the UK as the National Balancing Point benchmark natural gas price was at the equivalent of $4.30 per million British thermal units, while one of the main continental European prices, the Dutch Title Transfer Facility (TTF), was higher at the equivalent of around $4.65 per MMBtu. April 2 (LNGJ) - Elengy, France’s main LNG terminal operator, has issued new tariffs for the use of its two regulated terminals from the start of April 2019. Elengy revealed that there had been further decreases of 4 percent for the Montoir-de-Bretagne facility on the Atlantic Coast and a 5 percent reduction in tariffs at the Fos Tonkin facility near the Mediterranean port of Marseille. “Tariff applicable from 1 April 2019 for a standard cargo, about 150 000 cubic metres or 1 terawatt hour (TWh) is 0.79 euro per megawatt hour at Montoir and 1.22 euro per MWh at Fos Tonkin,” said Elengy, with further details available on its Web site. “In addition, there is a 25 percent discount (approx.) on the spot service (last minute booking, i.e. made after the 20th of month) of 0.59 euro per MWh at Montoir for a full Q-Flex type cargo,” added Elengy. April 1 (LNGJ) - Tellurian Inc., the developer of the Driftwood LNG plant in Louisiana, said it hired former Sempra Energy executive Octavio M.C. Simoes as Senior Advisor to the Chief Executive Meg Gentle. Simoes recently retired from his role as President and CEO of Sempra LNG. “Octavio brings 38 years of impressive energy industry experience to Tellurian’s remarkable infrastructure team,” said Gentle. “At Sempra, he led the company’s LNG and natural gas midstream activities, including development and commercialization of Cameron LNG,” added Gentle. March 29 (LNGJ) - The 174,000 cubic metres capacity carrier “Creole Spirit” will unload a shipment on April 5 at the UK South Hook terminal at Milford Haven in Wales from the Cheniere Energy-operated Sabine Pass plant in Louisiana, according to the port authority. The US Gulf Coast delivery was heading for the UK as the National Balancing Point benchmark natural gas price was at the equivalent of $4.85 per million British thermal units, while one of the main continental European prices, the Dutch Title Transfer Facility (TTF), was at the equivalent of $4.70 per MMBtu. March 26 (LNGJ) - The 147,200 cubic metres capacity “Arctic Princess” will unload a cargo on March 27 at the Lithuanian terminal at Klaipeda from the Hammerfest plant in Norway operated by Equinor, according to shipping data. The 140,000 cubic metres capacity “Arctic Voyager” is scheduled to deliver a Norwegian cargo on March 30 to the Brazilian Salvador import terminal in northeast Bahia province. The 160,000 cubic metres capacity “Arctic Aurora” will unload a Hammerfest shipment on April 5 at the Barcelona terminal in northeast Spain. March 21 (LNGJ) - The 210,185 cubic metres capacity Q-Flex carrier “Al Bahiya” will unload a shipment on April 3 at the UK South Hook terminal at Milford Haven in Wales from the Ras Laffan plant in Qatar, according to shipping data. The delivery was heading for the UK as the National Balancing Point benchmark natural gas price was at the equivalent of $4.95 per million British thermal units, while one of the main continental European prices, the Dutch Title Transfer Facility (TTF), was higher at the equivalent of around $5.10 per MMBtu. March 18 (LNGJ) - Tsakos Energy Navigation, the Greek shipping company, has agreed charters for its two LNG carriers. Tsakos said that it signed deals for the “Neo Energy” and the “Maria Energy” for an aggregate period of 36 months. The revenues are expected to be in the region of $60 million. “With two vessels fixed on accretive medium-term charters, the company is examining further expansion in the sector,” said Chief Operating Office George Saroglou. The company’s diversified energy fleet currently consists of 48 vessels trading in crude, 15 in products, three are shuttle tankers and two are LNG carriers. March 13 (LNGJ) - Taiwan, the world’s fifth-largest LNG importer, plans to build a third regasification terminal at Tao-Yuan in northwest Taiwan while also expanding its facilities at Tai-Chung and Yung-An in the south of the Island. Taiwanese energy company CPC said building was expected to start by the end of 2019. The proposed Tao-Yuan terminal could start operations in early 2023 with eventual capacity of up to 5 million tonnes per annum. CPC said that the Tao-Yuan project’s first phase would give import capacity of 3 MTPA and the volumes would be used by the state utility Taipower. Taiwan, or Chinese Taipei as it is also known, imported 16.8 million tonnes of LNG in 2018. March 8 (LNGJ) - Chinese natural gas imports rose in February compared with a year ago, though they were lower versus the January 2019 imports, according to the General Administration of Customs. Total natural gas imports, including both liquefied natural gas and pipeline gas, amounted to 7.57 million tonnes in February, down from 9.81MT in January, though up 9.2 percent from a year earlier. LNG and pipeline natural imports for the first two months of 2019 reached 17.36MT, up 18.5 percent from a year ago. March 6 (LNGJ) - ExxonMobil, one of the leading global LNG producers, said it had revised its US Permian Basin growth plans to produce more than 1 million oil-equivalent barrels per day by as early as 2024, an increase of almost 80 percent. The size of the company’s resource base in the Permian, located in West Texas and New Mexico, is about 10 billion oil-equivalent barrels and is likely to grow further as analysis and development activities continue. ExxonMobil has many faciities on the Texas Gulf Coast and is also building the Golden Pass LNG export plant with partner Qatar Petroleum. ExxonMobil said it was building infrastructure to support volume growth. Plans include construction at 30 sites to enhance oil and gas processing, water handling and ensure takeaway capacity from the Permian Basin. Construction activities in the Basin include central delivery facilities to handle up to 600,000 barrels of oil and 1 billion cubic feet of gas per day and enhanced water-handling capacity through 350 miles of an already-constructed pipeline. March 4 (LNGJ) - Kawasaki Heavy Industries of Japan is considering plans to construct liquefied natural gas carriers at a newly completed shipyard dock in northeast China as the company moves to reduce costs. The Chinese shipyard at Dalian in Liaoning Province has just completed the building of a second dock measuring 550 metres by 68 metres. The site is operated by Dalian Cosco KHI Ship Engineering, an existing joint venture between Kawasaki and China Cosco Shipping. Kawasaki currently builds its LNG carriers in Japan at its Sakaide shipyard in the western prefecture of Kagawa. Feb 27 (LNG) - ExxonMobil Corp., one of the main global LNG producers with stakes in multiple Trains in Qatar and elsewhere, said it added 4.5 billion oil-equivalent barrels of proved oil and gas reserves in 2018, replacing 313 percent of the year’s production. ExxonMobil's proved reserves totaled 24.3 billion oil-equivalent barrels at year-end 2018. Liquids represented 64 percent of the reserves, up from 57 percent in 2017. “We continue to add high-value, attractive assets to our portfolio that have positioned the company for long-term growth,” said Darren W. Woods, ExxonMobil chairman and Chief Executive officer. ExxonMobil is strengthening its position in the US onshore shale basins while developing the Golden Pass LNG plant in Texas with Qatargas. “Proved additions from unconventional plays totaled approximately 1.2 billion oil-equivalent barrels. Significant additions in the Permian Basin are supported by ExxonMobil’s growth plan including increased drilling activity and infrastructure development,” it stated. Feb 22 (LNGJ) - French maritime LNG storage technology company GTT is launching a programme for the creation of a “digital hub of excellence” in Singapore. “Specialised in maritime business process digitalisation, smart shipping and smart ports, the hub will be run by GTT's local subsidiaries: Ascenz Solutions Pte Ltd and GTT South East Asia,” said the French company. GTT said the shipping industry was increasingly opening up to new uses and services driven by information packages and software formulas. “In addition to LNG as fuel, a market in which GTT intends to grow, the digital services will enable us to explore new paths and deliver differentiating value to new segments within the shipping industry,” said GTT Chairman and Chief Executive Philippe Berterottiere. Feb 19 (LNGJ) - McDermott International, the US energy and LNG engineering company, has won two sizeable contracts, one from Sarawak Shell Berhad, a natural gas field operator and a unit of Royal Dutch Shell, and one from Sapura Exploration and Production, a Malaysian oil and gas services company, to provide transportation and installation of offshore structures, pipelines and pre-commissioning work for the Pan Malaysia field development located offshore Sarawak in Malaysia. McDermott’s scope of work for Sarawak Shell includes the transportation and installation of jackets, topsides and pipelines for the Gorek gas field. The company’s scope of work for Sapura includes the transportation and installation of jackets, topsides and pipelines for the Larak and Bakong gas fields. “These two contracts give McDermott the opportunity to strengthen our long-standing relationship with Sarawak Shell Berhad and develop a new relationship with Sapura Exploration and Production,” said Ian Prescott, McDermott’s Senior Vice President for the Asia Pacific region. “They also provide an excellent opportunity for McDermott to execute offshore projects in Malaysia using many of the company’s assets, from our highly-skilled and talented workforce to our marine assets and our global fabrication expertise,” added Prescott. Feb 18 (LNGJ) - Excelerate Energy, the US operator of floating storage and regasification units, and Norwegian energy company Equinor completed the first ship-to-ship (STS) transfer of liquefied natural gas in The Bahamas. Excelerate said the FSRU “Exemplar” and Equinor’s LNG carrier “Arctic Voyager” conducted the operation while moored at Equinor’s South Riding Point storage and trans-shipment terminal on Grand Bahama. “Excelerate conducted the industry’s first commercial STS transfer of LNG in 2007 and since then STS transfers have been completed and proven safe in a wide range of environments, now including The Bahamas,” stated Excelerate’s Chief Commercial Officer Daniel Bustos. “This new STS location allows us to provide additional commercial flexibility to our customers and respond to prompt market needs in a safe and reliable manner,” added Bustos. Feb 15 (LNGJ) - Tellurian Inc., developer of the US Driftwood LNG export plant in Louisiana, said it had signed an accord with Petronet LNG of India whereby Petronet was exploring the possibility of investing in the Driftwood project. “Petronet is India’s largest LNG importer, operating 20 million tonnes per annum of receiving terminal capacity with an additional 2.5 MTPA of capacity under construction at its Dahej expansion and a further 5 MTPA proposed at Gangavaram, said Tellurian President and Chief Executive Meg Gentle. Feb 13 (LNGJ) - Egypt has awarded five natural gas exploration concessions to Royal Dutch Shell, ExxonMobil Corp., Petronas of Malaysia, BP of the UK, and one other to Germany’s DEA and Italian company Eni in its latest round of tenders. The licence areas include the Western Desert, the Nile Valley and the Gulf of Suez. The gas awards mean that 20 wells will be drilled and Egypt expects investments of up to $800 million in the first stage of exploration. In addition to the gas licences there were seven oil exploration concessions in which 39 wells would be drilled. Eni’s discovery of the giant Zohr gas field in 2015 has raised interest in the East Mediterranean. The Zohr find and others have enabled Egypt to meet is rising domestic natural gas demand while arranging for the resumption of LNG exports. Feb 12 (LNGJ) - Inpex Corp., operator of the Ichthys LNG project in the Northern Territory of Australia, said it had shipped 20 cargoes since commercial operations began in October 2018, including 11 LNG by the year-end. The number was included in the nine-month earnings from April to December 2018 as it posted sales of 700.5 billion yen ($6.3Bln), down 0.4 percent from the same period of 2017. Inpex said its nine-month net income rose by 17.2 percent to 62.6Bln yen ($566 million) compared with 53.4Bln ($483M) in the same period of the previous year. Feb 8 (LNGJ) - Aker Solutions, the Norwegian energy and LNG engineering company, is getting back on track as it reported fourth-quarter net income of 178 million Norwegian crowns ($20.7M), up on the same three months a year ago. Aker’s full-year net income came in at 554M crowns ($64.45M) versus 239M crowns ($27.8M) in 2017. The company said its order backlog amounted to 35.1 billion crowns ($4 billion) and it forecast good times ahead for the industry. “We saw a record number of studies and front-end engineering work for larger and more complex projects than previous years, a positive sign of more work to come,” said Chief Executive Officer Luis Araujo. The company said tendering activity remained high in the main subsea and offshore markets. “Aker Solutions is currently bidding for contracts totaling about 45 billion crowns ($5.2Bln). About two thirds of this is in the subsea area and key projects are anticipated to be awarded over the next six to 12 months,” stated Aker. Feb 4 (LNGJ) - The 173,400 cubic metres capacity carrier “Flex Endeavour” will deliver a re-loaded cargo on February 7 to the UK South Hook import terminal at Milford Haven in Wales from the French Atlantic coast Montoir-de-Bretagne terminal, according to the port authority. The shipment was heading for the UK as the National Balancing Point benchmark natural gas price was at the equivalent of $6.55 per million British thermal units, while one of the main continental European prices, the Dutch Title Transfer Facility (TTF), was lower at around $6.35 per MMBtu. Feb 1 (LNGJ) - Calor, the UK’s leading provider of liquified natural gas for fuel stations, has further enhanced its refuelling network for natural gas-powered trucks by upgrading its Aust LNG facility, near the southwest city of Bristol. As part of the Severn View motorway auto-stop area for the services company Moto, the Aust facility is located off the M48 motorway by the Severn River Crossing. Calor said it is a vital refuelling stop for LNG-fuelled vehicles using the M4 corridor to travel to London or elsewhere in the UK, and has been upgraded to consider the requirements of mono-fuelled trucks. “As part of this upgrade, the new system uses ‘zero loss’ cooling technology to keep LNG within the storage tank at the ideal temperature and pressure for refuelling vehicles,” said Calor. “Similar work has been carried out at Moto’s Donington Park, Lymm and Grantham service stations, to add to Calor’s growing LNG infrastructure of six public refuelling facilities,” the UK company added. Mark Gilks, Transport Specialist at Calor, explained that demand for LNG continues to grow in the haulage industry, especially for long-haul vehicles and Calor continues to invest in its LNG refuelling network, which is the largest in the UK. “Leading truck manufacturers are predicting that, by the early 2020s, vehicles powered by natural gas could account for 20 percent of all HGVs sold.,” said Gilks. “This growing market share highlights the obvious benefits of choosing LNG to power long-haul HGVs now and into the future,” he stated. Jan 30 (LNGJ) - The 147,000 cubic metres capacity vessel “Min Rong” will deliver a cargo on January 31 to the Chinese Fujian terminal from the Tangguh export plant in Indonesia, operated by BP of the UK, according to shipping data. The 174,000 cubic metres capacity carrier “Gaslog Houston” will unload a shipment on February 2 at the Tangshan terminal in northeast China from the Gorgon plant on Barrow Island in Western Australia. The 172,000 cubic metres capacity “Kumul” will deliver a cargo on February 3 to the Chinese Qingdao terminal in eastern Shandong province from the plant in Papua New Guinea. The 174,100 cubic metres capacity vessel “Cesi Behai” is scheduled to deliver a cargo on Feb 6 to the Chinese Tianjin terminal for Sinopec from the Australia Pacific plant in Queensland. The 155,000 cubic metres capacity “Gaslog Savannnah” is delivering on February 8 to the Qingdao terminal, operated by Sinopec, from the Australia-Pacific plant in Queensland. The 210,185 cubic metres capacity Q-Flex vessel “Al Bahaiya” will unload a cargo on February 10 at the port of Tianjin from Qatargas at Ras Laffan. In other Asian deliveries, the 155,000 cubic metres capacity “LNG Venus” will deliver a cargo on February 7 to Singapore from Gladstone LNG in Queensland. The 216,000 cubic metres capacity vessel “Al Thumama” will unload a cargo on February 5 at the Map Ta Phut terminal in Thailand from the Qatargas plant at Ras Laffan. Jan 28 (LNGJ) - The 210,000 cubic metres capacity Q-Flex vessel “Al Oraiq” will unload a shipment on February 4 at the UK Milford Haven terminal in Wales from the Ras Laffan plant in Qatar, according to shipping data. The delivery was heading for the UK as the National Balancing Point benchmark natural gas price was at the equivalent of $7.40 per million British thermal units, while one of the main continental European prices, the Dutch Title Transfer Facility (TTF), was lower at the equivalent of around $6.95 per MMBtu. 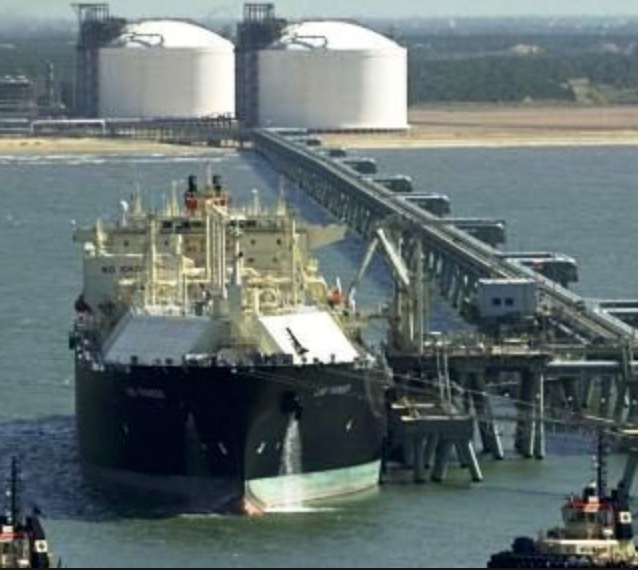 Jan 25 (LNGJ) - The Gorgon LNG export plant on Barrow Island in Western Australia, operated by Chevron Corp., has entered the second week of a shutdown of one of its three liquefaction Trains. Chevron said Train 3 at the plant had been closed since January 16 because of technical issues. The other shareholders in the Gorgon plant are Royal Dutch Shell and ExxonMobil Corp. The US$54 billion Gorgon facility came on stream in March 2016 with nameplate capacity of 15.6 million tonnes per annum from its three Trains. The plant mainly supplies Japanese customers such as Osaka Gas, Tokyo Gas and Jera Co. Inc.
Jan 24 (LNGJ) - Polskie LNG, the operator of the Polish import terminal at the Baltic port of Swinoujscie, said it had received environmental permits for its planned expansion of regasification capacity, storage and loading, allowing it to complete contract tenders. The Polish terminal began operations in 2009 and can currently receive almost 4 million tonnes per annum of LNG. Two tender procedures are currently in progress for the terminal. “The objective of the first is the selection of the contractor for three key components, construction of the third storage tank, process installations to increase regasification capacity and the LNG-to-rail transhipment installation along with a dedicated railway siding,” said the company. The deadline for the first tender has been extended to February 19. A second tender with a February 26 deadline is for the building of an additional jetty in cooperation with the Szczecin and Swinoujscie Seaports Authority. Jan 23 (LNGJ) - Indian Oil Corp. is starting the commissioning process for the first East Coast LNG import terminal at Kamarajar Port near Chennai. India's four operating import terminals are all on the West Coast at Hazira, Dahej and Dabhol near Mumbai and at Kochi in the southwest state of Kerala. The terminal at Kamarajar Port, formerly one of India’s main coal ports and previously called Ennore, will handle around 5 million tonnes per annum of imports for Indian Oil, a state-backed refiner and fuel distribution company that is also a shareholder in Petronet LNG. The Kamarajar LNG project is located about 25 kilometres from Chennai Port and initially the imports will supply natural gas to industry in the Manali area, including Madras Fertilizers Ltd., Chennai Petroleum Corp. and Tamil Nadu Petroproducts. Jan 22 (LNGJ) - Algerian state energy company Sonatrach, a main supplier to southern European LNG imports in France, Spain and Turkey, said it awarded a contract to China Harbor Engineering Co. to study, supply and build an additional marine jetty and port infrastructure at its Skikda LNG export plant on the Mediterranean coast. The Algerians said the contract was valued at 53 billion Algerian dinars ($445 million). The new jetty will allow classes of LNG carriers to dock and lift cargoes. “The project will be commissioned within 28 months after the engineering, procurement, construction contract enters force,” said Sonatrach. Jan 22 (LNGJ) - The 161,880 cubic metres capacity carrier “BW Pavilion Leeara” will deliver a US cargo on January 29 to the UK South Hook import terminal at Milford Haven in Wales from the Sabine Pass plant in Louisiana, according to the port authority. The shipment was heading for the UK as the National Balancing Point benchmark natural gas price was at the equivalent of $7.50 per million British thermal units, while one of the main continental European prices, the Dutch Title Transfer Facility (TTF), was lower at around $7.25 per MMBtu. Jan 21 (LNGJ) - The 173,400 cubic metres capacity carrier “Patris” will deliver a cargo on January 23 to the UK South Hook import terminal at Milford Haven in Wales from Zeebrugge in Belgium, according to the port authority. The delivery was heading for the UK as the National Balancing Point benchmark natural gas price was at the equivalent of $7.85 per million British thermal units, while one of the main continental European prices, the Dutch Title Transfer Facility (TTF), was lower at around $7.55 per MMBtu. Jan 18 (LNGJ) - GTT, the French liquefied natural gas storage tank technology company, said it received an order from the South Korean shipyard, Samsung Heavy Industries for the tank design of two LNG carriers on behalf of the Monaco-based fleet owner GasLog. The vessels will have storage capacity of 180,000 cubic metres and will be fitted with the GTT Mark III Flex-plus containment system. The two carriers will be delivered by the Samsung yard in the second and third quarters of 2021. “We are pleased to receive this new order from two long-term partners, SHI and Gaslog, which confirms the success encountered by our latest Mark III technology evolution,” said GTT Chairman and Chief Executive Philippe Berterottiere. Jan 18 (LNGJ) - The 165,000 cubic metres capacity carrier “Arwa Spirit” will deliver a US cargo on January 21 to the UK South Hook import terminal at Milford Haven in Wales from the Cove Point plant in Maryland, according to the port authority. The shipment was heading for the UK as the National Balancing Point benchmark natural gas price was at the equivalent of $8.00 per million British thermal units, while one of the main continental European prices, the Dutch Title Transfer Facility (TTF), was lower at around $7.65 per MMBtu. Jan 17 (LNGJ) - Dutch shipping line Anthony Veder said its small-scale LNG carrier, the 7,500 cubic metres capacity “Coral Methane”, has successfully carried out its first liquefied natural gas bunkering operation on the world’s first LNG-powered cruise ship at Santa Cruz de Tenerife in the Spanish Canary Islands. The “Coral Methane” fueled the “AIDAnova”, the newest ship from AIDA Cruises, which made history as the cruise industry’s first ship to be powered at sea and in port by LNG. “We believe LNG is today’s most sustainable marine fuel,” said Klaas Kerssemakers, Chief Operating Officer of Anthony Veder. “The delivery of ‘Coral Methane’ as an LNG bunker vessel, in partnership with Shell, underlines our dedication to LNG and marks the next step in our contribution to a sustainable supply chain,” added Kerssemakers. Jan 16 (LNGJ) - China is receiving ample January LNG shipments as about 20 carriers proceed to the network of import terminals with cargoes from nations such as Qatar, Nigeria, Australia and the US. Among the planned shipments, the 160,000 cubic metres capacity vessel “Arctic Aurora” is scheduled to unload a cargo on January 18 at the Ningbo facility in Zhenjiang province from the Queensland Curtis plant in Australia, according to shipping data. The 174,100 cubic metres capacity “Cesi Gladstone” will unload a shipment on January 21 at the northeast port of Tianjin from the Australia-Pacific LNG plant in Queensland. The 148,300 cubic metres capacity carrier “LNG Ondo” will deliver a cargo on January 24 to the Qidong terminal in Jiangsu province from the Nigeria LNG plant on Bonny Island. The 170,050 cubic metres capacity carrier “Hoegh Giant” is scheduled to arrive on January 25 at the Chinese port of Tianjin with a cargo from the US Sabine Pass plant in Louisiana. The 266,000 cubic metres capacity Q-Max carrier “Al Dafna” will deliver a cargo on January 25 to PetroChina’s Tangshan terminal in northeast Hebei province from Ras Laffan in Qatar. The 210,100 cubic metres capacity Q-Flex vessel “Al Ruwais” will deliver a Qatargas cargo on January 28 to the Tangshan facility. The 145,700 cubic metres capacity carrier “LNG Benue” is also scheduled to arrive at Tangshan with a Nigerian cargo on January 29. Jan 15 (LNGJ) - The 210,100 cubic metres capacity Q-Flex carrier “Al Ghariya” will deliver a cargo on January 19 to the UK South Hook import terminal at Milford Haven in Wales from Ras Laffan in Qatar, according to the port authority. 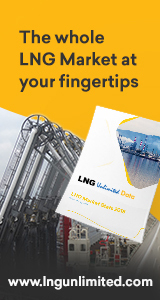 The delivery was heading for the UK as the National Balancing Point benchmark natural gas price was at the equivalent of $7.40 per million British thermal units, while one of the main continental European prices, the Dutch Title Transfer Facility (TTF), was lower at around $7.27 per MMBtu. Jan 14 (LNGJ) - Crowley Maritime Corp. said its new combination LNG-powered container-roll-on roll-off ship, the “Taino”, successfully completed its first voyage to Puerto Rico after receiving fuel for the first time at the Eagle LNG bunkering station in the Florida port of Jacksonville and departing on January 8. “The successful transit puts a historic capstone on the company’s Commitment Class modernization project and begins a new era of world-class supply chain services between the island commonwealth, the US mainland and the Caribbean Basin,” said Crowley. The ship is the second to have entered service after being constructed with LNG propulsion at the VT Halter Marine shipyard in Pascagoula in the state of Mississippi. Jan 11 (LNGJ) - US LNG exports were stable over the past week as 10 LNG vessels departed from the three liquefaction and export plants in operation, seven from Sabine Pass in Louisiana, two from Cove Point in Maryland and one from Corpus Christi in Texas. The 10 vessels had a combined LNG-carrying capacity of 36.2 billion cubic feet and one other carrier was lifting a cargo from Cheniere Energy’s Sabine Pass through January 10, according to the weekly natural gas report from Energy Information Administration. US LNG exports reached a new record high in December 2018 when 36 cargoes were exported, including the first from the Corpus Christi plant on December 11. Jan 10 (LNGJ) - Eagle LNG, a subsidiary of Ferus Natural Gas Fuels, said it supplied fuel to the Crowley Maritime Corp. vessel “Taino”, the second of two of the world’s first combination container and roll-on-roll-off ships powered by LNG. The “Taino” was refueled at the Eagle LNG shoreside bunkering depot at Jacksonville port in Florida before starting service on the Puerto Rico trade route. The “Taino”, built at the VT Halter Marine shipyard at Pascagoula in Mississippi, is joining its sister ship “El Coqui” to provide fast and environmentally-friendly shipping between Florida and the US territory in the Caribbean at a cost of $550 million, including port upgrades. Jan 9 (LNGJ) - TransCanada Corp., the pipeline company with natural gas and other infrastructure in Canada, the US and Mexico has decided to change its name to TC Energy “to better reflect the scope of the company’s operations” as a leading North American energy player. TransCanada’s shareholders will be asked to approve a special resolution to change the name at the company’s next annual meeting to be held in the second quarter of 2019. “TC Energy better reflects the breadth of our business and acknowledges our proud history of safely and responsibly delivering the energy that millions of North Americans rely on every day,” said Russ Girling, TransCanada’s President and Chief Executive. “We believe the name TC Energy clearly articulates our complete business - pipelines, power generation and energy storage operations - and reflects our continued continental growth,” added Girling. Jan 9 (LNGJ) - The American Bureau of Shipping, the US classification society offering services for vessels and projects in LNG and other sectors, has formally opened its new global headquarters in the town if Spring in Texas. The HQ is a 10-storey, 326,800-sq-ft building housing employees from ABS and its affiliated companies. “This is a significant milestone in our 157-year history and reaffirms our commitment to provide industry-leading safety and practical technology solutions for marine and offshore industry challenges,’’ said ABS Chairman, President and Chief Executive Christopher J. Wiernicki. “A five-year journey that started as an idea has now culminated in a building reflecting our leadership position and our continued vision for growth,” he added. Jan 8 (LNGJ) - Four Nigerian LNG cargoes will be delivered in the next week to import terminals in Spain and Portugal. The 141,000 cubic metres capacity carrier “LNG River Niger” will unload a shipment on January 10 at the Barcelona terminal from the Bonny Island plant in Nigeria. The 162,000 cubic metres capacity vessel “Esshu Maru” will deliver a cargo on January 11 to the Huleva terminal in southwest Spain and the 148,471 cubic metres capacity carrier “LNG Kano” will unload a shipment on January 16 at the Bilbao terminal in northwest Spain. The 160,400 cubic metres capacity Cubal, which normally delivers shipments from Angola, lifted a Nigerian cargo on January 4 from Bonny Island and will deliver it to the Portuguese Sines facility on January 11. Jan 7 (LNGJ) - The 210,100 cubic metres capacity carrier “Al Sheehaniya” is scheduled to deliver a cargo on January 12 to the UK Dragon LNG import terminal at Milford Haven in Wales, owned by Royal Dutch Shell and Petronas of Malaysia, according to the port authorities. The shipment is from Qatargas at Ras Laffan in the Gulf. The vessel is scheduled to arrive as the UK National Balancing Point benchmark natural gas price was at the equivalent of $7.75 per million British thermal units, while one of the main continental European prices, the Dutch Title Transfer Facility (TTF), was lower at the equivalent of $7.65 per MMBtu. Jan 4 (LNGJ) - The US Army Corps of Engineers said it awarded a $92 million construction contract to Great Lakes Dredge and Dock Company to deepen and widen the Corpus Christi Ship Channel (CCSC) from the Gulf of Mexico to Harbor Island. The contract work will increase the depth from -47 feet Mean Lower Low Water (MLLW) to -54 ft MLLW from the jetties at the entrance of the ship channel to Harbor Island and will extend the CCSC into the Gulf of Mexico to -56 feet MLLW. “We commend the Army Corps of Engineers for progressing the highly anticipated Corpus Christi Ship Channel Improvement Project, and the selection of Great Lakes Dredge and Dock to perform on this first contract is an extraordinary step forward in positioning the United States as the largest exporter of energy in the world,” said Sean Strawbridge, Chief Executive of the Port of Corpus Christi. Jan 3 (LNGJ) – Seven cargoes will be unloaded at European terminals in the next week. The 145,000 cubic metres capacity “Methane Rita Andrea” is delivering a shipment on January 3 to the Aliaga facility near the port of Izmir in Turkey from the Trinidad plant in the Caribbean, according to shipping data. The 75,000 cubic metres capacity carrier “Cheik Bouamama” is unloading a cargo on January 4 at the Italian Panigaglia terminal near Genoa from the Skikda plant in Algeria. The 141,000 cubic metres capacity vessel “LNG Cross River” will deliver a cargo on January 4 to the Sines terminal in Portugal from the Nigerian plant on Bonny Island. The 147,200 cubic metres capacity vessel “Arctic Princess” is scheduled to deliver a shipment on January 5 to the Dunkirk import terminal on the Channel coast of France from the Equinor plant at Hammerfest in Norway. The 216,000 cubic metres capacity vessel “Al Hamla” is scheduled to deliver a Qatargas shipment on January 5 to the Swinoujscie terminal in Poland. The 150,200 cubic metres capacity vessel “Seri Camar” will deliver a cargo on January 9 to the Aliaga facility in Turkey from the US Cove Point plant in Maryland. The 145,000 cubic metres capacity vessel “Milaha Qatar” will unload a Qatargas shipment on January 11 at the Adriatic LNG import facility in Italy.